Big Ben is the nickname for the great bell of the clock, located at the top of the 320-foot-high The Elizabeth Tower, on the north side of the Houses of Parliament in Westminster, London. The original Big Ben, a 14.5 tonne bell for the Tower of London was cast in Stockton-on-Tees by Warner's of Cripplegate. This however cracked during testing and was recast at the Whitechapel Bell Foundry as a 13.8 tonne, 2.2 metre high bell which is in use today. 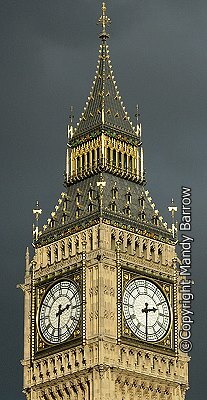 The Big Ben bell strikes the pitch of “A” The other bell in the tower, the four “Quarter Bells” provide the chimes, and are tuned to the pitch of G sharp; F sharp; E and B. 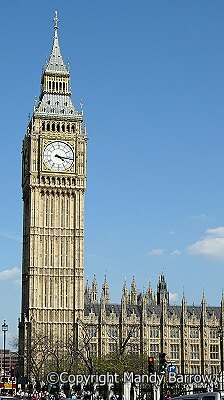 Big Ben is the world's largest four-faced chiming clock. The clock became operational on 7th September 1859. The four faces of the clock are 55 meters above ground. The clock faces are 23 feet (7m) in diameter. The hour hand is 9 ft (2.7m) long, and the minute hand is 14 ft (4.3m) long. The pendulum is 3.9m long, weighs 300Kg and beats once every 2 seconds. "O Lord, keep safe our Queen Victoria the First"
The clock tower is the focus of New Year celebrations in the United Kingdom, with radio and TV stations tuning to its chimes to welcome the start of the year. 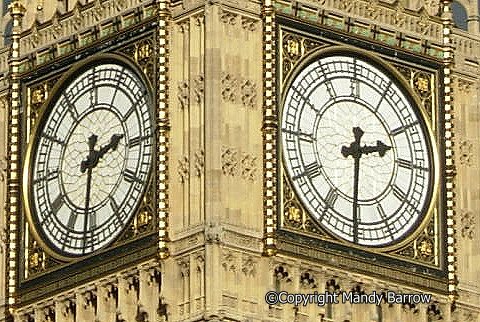 On Remembrance Day, the chimes of Big Ben are broadcast to mark the 11th hour of the 11th day of the 11th month.